From the regular maintenance that keeps your Rover reliable to major repairs and customization, Lamorna Garage, Seattle's independent Land Rover & Range Rover specialists, can look after your Range Rover, Discovery, Defender, or Series Land Rover. 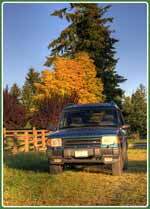 Our repair shop is located in the Greenwood neighborhood of Seattle, Washington. We handle brakes, electrical repair, suspension work and engine transplants. Our mechanics can take care of everything from an oil change or tune-up service to a rebuild for your EFI V8, and we have expertise in Rover diesels from the Series One 2.0L up through the 300 TDI and TD5. And if you have a Series petrol, we can keep it running in top shape. We have extensive experience in common Rover ailments including head gasket repair and power steering leaks. We offer in-house repair and rebuilds of axles, transmissions and transfer cases and are happy to assist with the "heavy lifting" aspects of customer restorations such as custom welding and corrosion repair. Lamorna's staff is experienced with all aspects of off-road preparation including mounting gear such as winches and roof racks. We can even convert your Series Rover to coil-spring suspension. Our experience shows that Genuine Rover Parts most often give the best value by insuring proper fit, longer life and a reliable repair. We are always happy to discuss specifics related to your projects. If you're a Land Rover enthusiast, you might want to mark your calendar for some of this summer's British car shows. You can display your vehicle with the fleet of Rovers from across the years or just drop by and oogle the fine trucks — and sports cars, too. Looking for a chance to get your Land Rover's tires dirty? Check out the Northwest Challenge, the regional Land Rover competition that draws teams from Washington, Oregon and British Columbia.